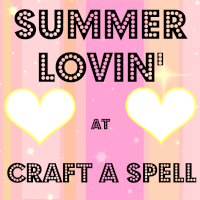 The Summer Lovin' series is back! Next up we have Christina from The Scrappy Housewife. Her motto is vintage wisdom in a modern world - something I believe we all need more of! She is sharing something completely different from anything I'd ever post - a recipe with onions in it! Hey y'all! My name is Christina aka The Scrappy Housewife and I am thrilled to be here guest posting for Dianna today and sharing one of my favorite summertime recipes with all of you! In case the "y'all" didn't give it away, I'm a Southern girl, and growing up in the south meant fabulous food and family in the summer time. I cannot tell you how many times I've sat on the porch with my Mom and Memaw (that's grandma for you northerners) snapping beans on a summer Sunday afternoon. Food is big in the south and not all of it is loaded with lard and butter. Some of it is really healthy! 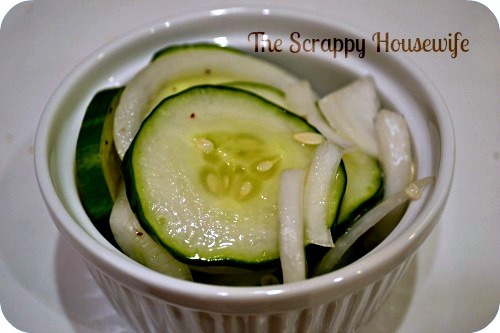 Which leads me to one of my favorite summertime recipes - Pickled Cucumber and Onion. It's super simple. Slice the cucumbers and onion (I use a mandolin but you can definitely use a knife instead - just make sure you make your slices about 1/8" thick). Mix the vinegar, sugar, salt and pepper in a large bowl (preferably one with a tight fitting lid) and toss in the cucumbers and onions. Pop on the lid and give it a good hearty toss. If you don't have a lid, just make sure you toss everything together and make sure everything is coated and in contact with the liquid. Chill for several hours, toss/stir occasionally. That's it! As any good Southern cook does, I tend to cook by tasting as I go. Once you get everything tossed together, make sure you give it a taste to make sure it's as sweet or sour as you want it. Adjust the vinegar or sugar accordingly. And y'all - It will get more tart the longer it sits. 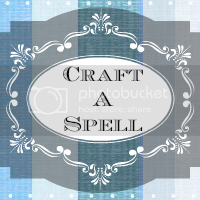 I hope y'all will pop over and visit my blog The Scrappy Housewife or my Facebook page. 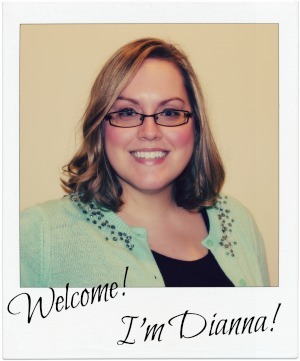 Thanks for letting me stop by Dianna! I didn't know it was so easy! Yum, and thanks for sharing. Can't wait to try this!